Uttara “Tara” Gadde recently graduated from Cornell University with a B.S. in Human Biology, Health & Society and a minor in Policy Analysis & Management. 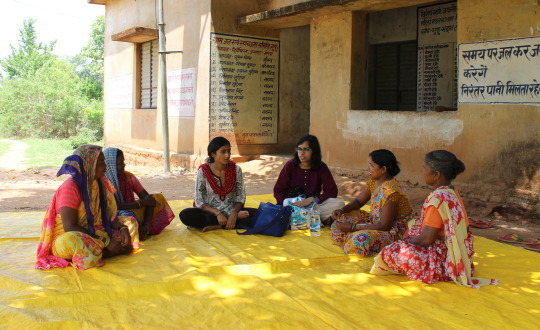 As a TCi Intern, she will be evaluating the health and socioeconomic impacts of a clean water project implemented by AguaClara and PRADAN in Jharkhand. “You can see yourself!” I said in broken Hindi. “Kya baat hai! Wow!” The women said as I brought the iPhone in front of them. We all shared a smile at the mazaa (fun) of this new technology and I pressed the button. And just like that, I had taken a selfie with the tribal women of Gufu village. I am working in the rural villages of Jharkhand as a TCi Intern this summer. Paired with TCi PhD Scholar Shiuli Vanaja, we will be looking at the economic and health impacts of the AguaClara water treatment technology. AguaClara is an engineering firm started by several Cornell alumni, and is supported by TCi. The technology is gravity powered and provides safe water on tap to households. Inadequate access to safe water is a major problem in the state of Jharkhand, leading to loss of time spent on productive activities since water sources are often very far from households. Poor water quality can also lead to various water-borne diseases including diarrhea, typhoid, gastrointestinal problems, and skin lesions. It can also indirectly cause malaria from standing water sources, a major problem in the tribal villages. We are working in conjunction with the NGO PRADAN to understand the impact of the availability of purified tap water at the household level. 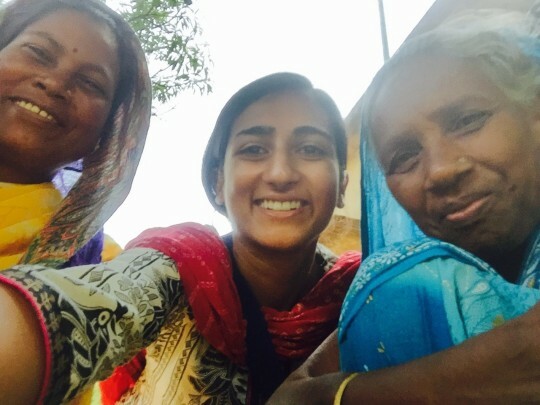 The women I had taken a selfie with were all part of a Village Water and Sanitaiton Committee, established by PRADAN as a channel to empower women and engage them in improving their own communities. Currently, we are working in Ronhe, a small village of approximately 190 households. AguaClara supplies water to 100 houses in the village. Our first task was to create a meaningful survey that captures the two main markers we are evaluating: economic and health indicators. After several revisions, we finally put together a questionnaire to be used for primary data collection. We decided to focus specifically on women, since they are the people who interact with water collection and usage most frequently. On our first day, we met with the Village Water and Sanitation Committee to introduce ourselves and explain our purpose. This was pivotal to our study, since we were able to form a relationship with women leaders in the community from the beginning of the project. This initial introduction allowed us to travel through the village and engage in open discussions with the women without the hesitation that may come with speaking to strangers. Interviewing women has been an incredible experience. The tribal villages are relatively egalitarian, but the woman must still bear the brunt of household chores, caretaking of children, preparation of food, and collection of water when the AguaClara tap is not running. She is the heartbeat of the household, and to hear her story is truly enriching and inspiring. I think of the selfie I took on my first day here. It represents an intergenerational, cross-cultural exchange of different lifestyles, perceived gender roles, and inequities in access to technology. But despite these differences, there is a constant that remains: an unequivocal desire for the wellbeing of the family. Though I have come from thousands of miles away, we share the same dream for the safety, health, and prosperity of our loved ones. This picture represents a moment captured in time between women whose day-to-day lifestyles may be very different, but whose basic values are not. Safe water is essential to the prosperity of the family, a fundamental dream that traverses all social boundaries. I am incredibly excited to continue working with PRADAN and AguaClara to get a better understanding of the water situation in the area, and to see how we can use our research to improve the quality of life of this population.